I think a guy could propose with a necklace, don't you? If he was smart and he knew you were fussy and he was pretty sure it was a good idea to let you pick out your own ring.... Let's be honest. Who doesn't want to pick out her own ring?? *Which I still want, don't get me wrong. Let me know if you need my address or whatever. oh, not me! a) I am a total junkie for surprises and b) BF has exceptional taste. 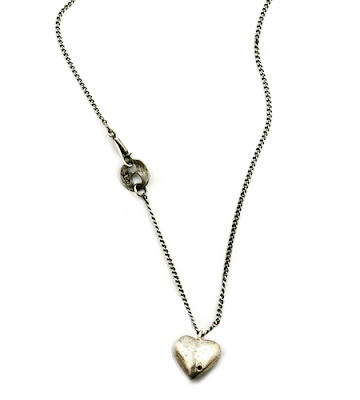 i'm concerned about all of the heart-shaped jewelry that's made it's way onto this blog recently. stop with the hearts already. go back to the antler ring...or the tree stump. Aww.... I like it. Of course, I'm a big mush. i totally picked out my ring... although, i didn't think i was really gonna get it. oh i would love to get the necklace and then pick my own ring! the question not about the jewelry!? @Liz HAHA! I surprise myself about also liking this lil' heart necklace. I normally gag at them. Agreed, I would have loved to pick my own ring, duh. I ended up er, providing input which he used, then I belatedly found out his 1st pick was pretty charming. you get what you wished for right? acourse, price was an object as we are neither independently wealthy nor willing to give up "3 mos salary" or whatever it is these days.